Warm up this winter with this Cauliflower, Broccoli and Kale Soup. 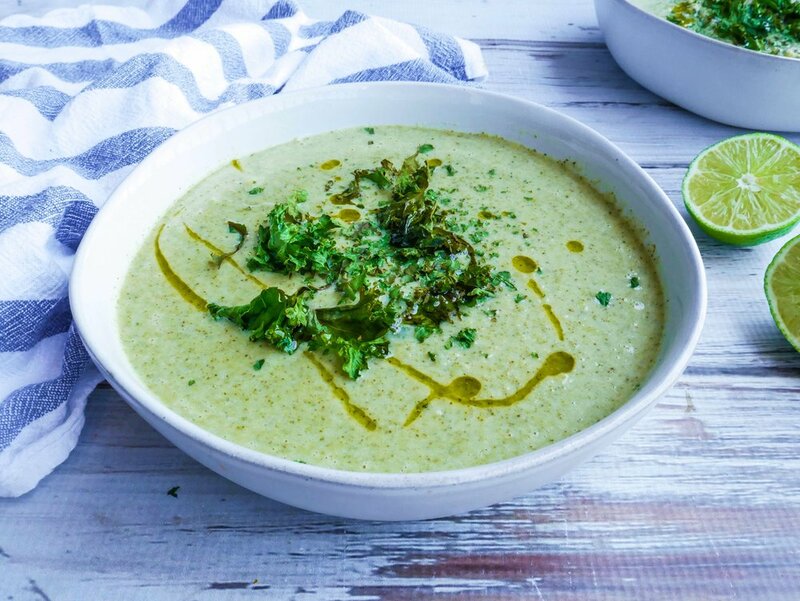 The combination of cauliflower, broccoli, kale, garlic, lime juice and cayenne pepper create a nourishing and creamy soup. Roasting the vegetables adds extra flavour. Serve with warm bread and butter. Broccoli is a cruciferous vegetable which means it is a powerful antioxidant, high in fibre, a good source of vitamin E, vitamin B6 and B1, zinc, omega 3 fatty acids, potassium, iron and selenium. Cauliflower is an excellent source of vitamin C, vitamin K, fibre and omega 3 fatty acids. If you're wanting more recipes that contain cauliflower or broccoli, check out the 5 a day NZ website, there is an amazing selection. Pre heat the oven to 180 degrees on fan bake and line an oven tray with baking paper. In a bowl, toss the cauliflower, broccoli, onion, garlic, thyme, cayenne with 3 tablespoons of olive oil. Place onto the lined oven tray and roast for 20 minutes or until golden.On a separate lined oven tray, place the kale and cover with 1 tablespoon of olive oil. Place into the oven and bake for 10-15 minutes or until it becomes crispy. In a large pot, add the roasted vegetables and stock, bring to a boil. Reduce the heat and let simmer for 15 minutes. In a blender or food processor, blend the soup. This will need to be done in batches. Once the soup is smooth and creamy, pour into bowls and sprinkle with the roasted kale, juice of the lime, salt + pepper, and a drizzle of olive oil.